Normally, I publish only a short excerpt of the newsletter here on the blog. 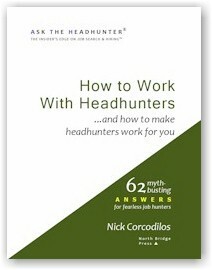 But this is the last newsletter of 2010, and it’s a summary of some of the main ideas of Ask The Headhunter. I’m posting the entire December 21, 2010 newsletter online: Click here for the full edition of Ask The Headhunter in a Nutshell. 1. The best way to find a good job opportunity is to go hang out with people who do the work you want to do. 2. The best way to get a job interview is to be referred by someone the manager trusts. 3. The best way to do well in an interview is to walk in and demonstrate to the manager how you will do the job profitably for him and for you. 4. The best way to get a headhunter’s help is to manage your interaction for mutual profit from the start. For the details behind each tip, please see the newsletter… And as always, please post your comments here on the blog! Answer Kit: How Can I Change Careers? This limited offer is good only through Christmas week! Don’t miss it! The 2-Book Bundle makes a great gift! That’s the Readers’ Forum question this week. All through the year, I try to teach the nuts and bolts behind the four main ideas discussed in today’s newsletter. Your questions help me flesh out the details of these ideas — and that’s what every edition of the newsletter is about! In this week’s Readers’ Forum, The Headhunter Asks You: What more do you need to be successful at job hunting and hiring? What daunting problems or challenges can I help you deal with in your job search (or if you’re a manager, when hiring)? Please share your questions, problems and challenges, and I’ll do my best to help, right here on the blog, and in next year’s newsletters. I welcome you to pile on — please tell me where I can help! Meanwhile, here’s wishing everyone a very Merry Christmas, Happy Holidays (no matter what holidays you celebrate or where you celebrate them), and a Happy, Healthy, and Prosperous New Year! Readers’ Forum: How much should I pay a new hire? In the December 7, 2010 Ask The Headhunter Newsletter, an employer asks how to set the salary for a job offer. I’m an employer, and I need some information on the average salary I should expect to pay an experienced (5-10 years), degreed individual to manage part of my software company. I am looking for someone who can take over and manage with little or no supervision. How do I set a salary on this? No salary database describes your position, or the particular manager you want to hire. You might find some data that appear to be relevant, but just one factor could throw off your entire calculus and lead you to make a terrible mistake. Ask yourself, Is my hiring strategy to limit my costs, or to boost my profits? That is, are you willing to pay more to get more? This requires some analysis that few employers consider. How much added profit could a candidate add to my business? In the interview, ask candidates to discuss their abilities in those terms. How would they increase your profits by 10%? Decrease your costs by 15%? Create products that increase market share by 20%? Then, pay based on added profit. A candidate who can answer those questions in a compelling way may be worth more than the market—or any salary survey—suggests. So, think out of the box. Turn your interviews into working meetings where you and the candidate roll up your sleeves and tackle ways to improve the job to make it more profitable. Maybe HR told you there’s $X in the budget for the job you want to fill. Maybe you checked the industry averages and set the salary range accordingly. Maybe you picked a number out of a hat. Maybe you have no idea how the job is supposed to contribute to your bottom line! Which is it? How do managers decide what salary to offer a new hire? Let’s talk dollars. How do you think they should do it?